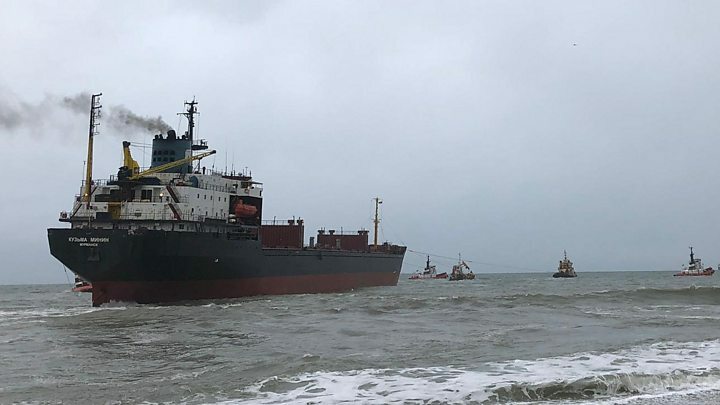 A 16,000-tonne Russian cargo ship ran aground off a beach in Cornwall. The Kuzma Minin grounded off Gyllyngvase Beach in Falmouth at about 05:40 GMT. The Maritime and Coastguard Agency (MCA) declared a major incident and said the 590ft (180m) ship had a list of about five degrees. The massive vessel, which had 18 Russian crew members on board but no cargo, was refloated in a "tricky and delicate" operation at high tide. Three harbour tugs and a lifeboat towed the ship off the beach just after 14:00. Marc Thomas, senior coastal operations manager, said the coastguard had been forced to work "really hard to manoeuvre the vessels" during windy conditions. Falmouth harbourmaster Mark Sansom said: "This has been a successful and well co-ordinated operation involving multiple agencies. "We would like to recognise the outstanding performance of the pilot and of all vessel crews involved in what was a very demanding incident. "The Kuzma Minin has been taken to Falmouth Bay to anchor, in order for it to be inspected." The coastguard said there had been no reports of any pollution. An earlier effort to refloat the ship failed when tow ropes snapped. A helicopter team winched coastguard members on to the ship earlier in order to check up on the Kuzma Minin's crew. Supt Matthew Longman from Devon and Cornwall Police warned members of the public to stay away from the beach where the ship ran aground. "It is important to let the public know that there is no cargo on this ship," he said. "We all remember the scenes when the Napoli ran aground in east Devon. I'm afraid there are no such spoils on the Kuzma Minin." Former pilot, David Barnicoat told the BBC it looked like "a classic grounding". "It sounds as if she dragged anchor and the engines may not have been ready, or she may have had some other problem," he said. "Once that anchor breaks from the sea bed and you start dragging, then you have no control whatsoever." One witness, Megan Hocking, said she was "thinking of everybody on the tugs and lifeboat - terrible conditions for a rescue mission". Falmouth resident Jess Hughes described the weather on the Cornish coast as "extreme" and said it had been "horrendously windy" on Monday night. Gyllyngvase Beach is a sandy tourist beach about 10 minutes from Falmouth town centre.